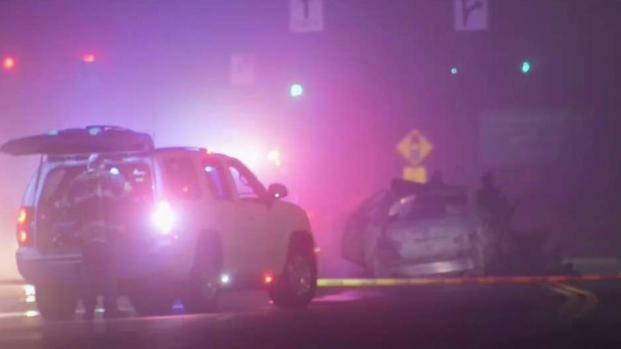 Two people are dead in a horrific five vehicle crash that happened in Inwood, Long Island overnight. Greg Cergol reports. 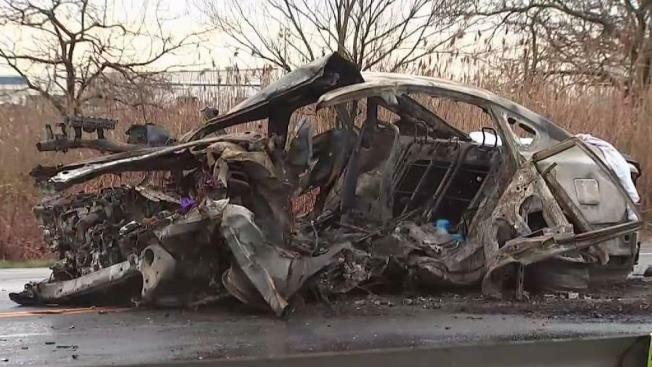 A 25-year-old woman and a 35-year-old man from Brooklyn have both been charged with DWI in the fiery chain-reaction crash near John F. Kennedy Airport that killed two people and injured seven others Wednesday, officials say. The woman, Zakiyyah Steward, also faces charges of driving while impaired and possession of marijuana. She was one of the seven hurt but was not seriously injured. The man, Rahmel Watkins, remains hospitalized for his injuries. Both prosecutors and police refused to comment on reports the two had been drag racing. Yisroel Levin, 21, and Elisheva Kaplan, 20, were killed in the multi-car wreck on the Nassau Expressway near Burnside Avenue in Inwood around 1:30 a.m. Wednesday. Community sources tell News 4 they were a happy, newly engaged couple who were planning to move to Israel after they were married. "Jewels of the community, just wonderful kids," said one mourner. "Just a tragedy that something like this can happen for no reason." Efrem Bernstein, who taught Levin in high school, said, "They always made one feel happy just being in their presence, in every way, and that's part of the true tragedy." Photos from the couple's funeral in Far Rockaway Thursday show their caskets being carried through the streets, surrounded by distraught family and friends. Details on the other injured victims weren't available. Cops responding to the scene found at least one car completely engulfed in flames, and those victims' bodies remained trapped in the charred wreckage for hours as authorities investigated. Steward has pleaded not guilty to the charges; her defense attorney told reporters that no one can say she's at fault without proof. And she shook her head no when asked by reporters outside court when asked if she was impaired while driving. A fiery, chain-reaction crash involving at least five cars on Long Island near JFK Airport has claimed the lives of at least two people, sources say. Wale Aliyu reports. Steward's father defended her at a court appearance Thursday, disputing allegations that she was under the influence. He said that according to his daughter, she was a victim, too. "They're bogus charges, they're looking for a scapegoat," said Zakiyyah Steward, claiming it was the killed couple who caused the pileup on Nassau Expressway. Steward, a former UPS worker in Brooklyn, has a prior record, and was set to be sentenced this month for a burglary in Brooklyn from several years ago. Bail has been set at $25,000.